Japan has an old and grand tradition in the art of metalworking. There is not just one center of knife making, like Solingen in Germany, but many, spread out over the entire country. The knife makers vary, sometimes a great deal, in their size, and use of technology. Their products also differ considerably in quality, often in ways that cannot be seen, and in the way they please the eye and the hand. The self-employed knife smith who works alone and produces a variety of knives by hand that are functional but can also be seen as art. All of the fundamental steps in the knives' production are done by the artisan himself, and each knife's quality is guaranteed by the smith's own name and reputation. These smithies are very small, often under 20 square meters in size. Sometimes several artisans share a room and machinery, for example in a co-operative. But they each make their own unique products under their own names. The co-operative is only a way to make more efficient use of resources. This type of co-operative is not very common though. Under Japanese guild rules, these smiths must have long years of training and practical experience behind them. You will find that the highest quality knives, and also the most expensive ones, come from this type of smith. The price depends on the materials used, and the reputation of the smiths. The quality is not always visible, it can only be experienced in use. The look of many of these types of knives is heavily influenced by Zen-Buddhism. This aesthetic doesn't appeal to every Western eye immediately, and to many people the knives can at first look strange and unwieldy. Hand manufacturing: The knives are produced entirely by hand, using traditional tools and processes. The difference is that the artisans, who often have the skills of master smiths and could work alone, have retreated, for economic reasons, into small manufacturing operations. Such firms usually have between 5 and 20 workers, and work much more like a team of artisans than a conventional factory. Here one cannot say that a knife came from the hand of this or that knife smith. It is much more a collective operation, but at the same time, every step of the process is done by hand using traditional methods. Handmade knives can be more economically produced in this fashion. In this market segment, one finds premium quality knives, with very little difference in quality in comparison with the one-artisan knives. Professional cooks, fishmongers and sushi-chefs for example, often use these kind of premium knives. Picture: Sharpening the rough-ground and hardened knife blades on a wet grinding wheel. The raw blades are clamped in a wooden jig and the rest is done by hand. To use the big grinding wheels, the grinders half stand, half lay, on a sort of pillow attached to the top of the machine. 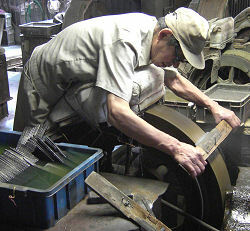 It takes at least three years' training to learn how to grind blades using this technique. Industrial production: Here one finds knives made with conventional mass production. The blades are first die-forged (raw metal pressed into a form or die) to mass produce the blade blanks, then passed through a special furnace to be hardened, and annealed, or tempered. At some factories the blades are also ground and sharpened automatically by machine. These methods are used only for mass-produced knives. Under Japanese guild rules, even the big industrial producers have not totally been cut off from their artisan roots. They will still often produce small lots of knives by using more traditional hand methods, for instance when there is only a limited demand for a specialised knife. Normally mass-produced knives are bought for everyday use in private kitchens. The companies that supply us at Fine Tools have demonstrated that they can use mass production to produce consistently excellent quality knives. Professional cooks around Japan and the world are also happy to use and recommend these kinds of Japanese knives, and one cannot find a better a higher commendation than that. These kind of knives are much less expensive than the hand-produced knives. 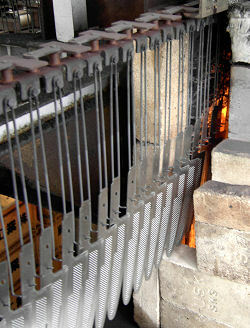 Picture from the Fujitora knife factory: blade blanks are passed through a computer-controlled hardening furnace. When you are looking for a Japanese knife, you will discover an enormous range of prices, which for the layman can be difficult to understand. The rule of thumb is simple. Japanese knives are not more expensive than European knives of similar quality, and at Fine Tools, you get what you pay for, in terms of quality and the production methods described above. Then there are the decorative touches, such as Damascus steel blades, on some of the knives. They do not affect the cutting ability, but they do affect the price. Such knives are beautiful, and a pleasure to use. But contrary to a widely-circulated misunderstanding, all Japanese knife blades have a core of high-carbon steel which forms the cutting edge. The wood-grain-like waves in the Damascus steel blades are only layers forged to the side or sides of this core. What is most important is that one does not pay a high price for a low-quality knife, or even worse, fall for a sleazy add campaign and buy a knife that simply does not cut well. Watch out for the "special offers" in kitchenware stores, supermarkets or on the internet, where the price and the claimed quality of the merchandise do not go together. A three-piece "hand-forged Japanese knife set" cannot be had for 30 euros. That is simple and absolute rubbish. Another trick, much-loved by some marketers and dealers, is to portray a knife smith as heir to the ancient and rightly famous tradition of crafting samurai swords. The idea is that the knives are somehow ennobled by association with this tradition, when in reality, only the price is ennobled. While these swords are among the finest tools ever devised for hacking off, say, a head, they are not much use for slicing garlic. The forging of knife blades and the training of knife smiths is a completely different tradition. Buy the knife you need. In every category, we have some of the best knives you can find for the price. If you don't know exactly what you need, try a simple all-purpose knife with a three-layer blade. With this kind of knife one can best learn the merits of Japanese knives. Then later you could try out a Sashimi Hocho (fish knife) and a Nakiri Hocho or a Usuba (vegetable knives), or the right knife for whatever kind of food you like to cook.